We invite you to take the unique opportunity to fly by helicopter and enjoy the scenic panorama and the mighty Himalayas during your visit to Nepal. 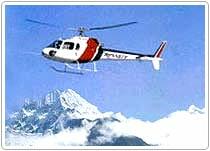 Helicopter service is available in Nepal for every reason and occasion and you can reach to any corner of Nepal of your choice even without airstrips and runways. The best advantage of a chopper is that it can easily take off and land in a minor space and marginal weather conditions compared to planes. The helicopter service companies have excellent reputations and proven records for dependable emergency and rescue flight operations. There are eight helicopter companies operating in Nepal. Helicopter tour to various popular pilgrimage sites which also includes the remotest part of Nepal is gaining momentum these days. Please find the telephone numbers of Helicopters operators in Kathmandu below .